Pierre-Emerick Aubameyang scored twice on MD34 to claim the top scorer crown. 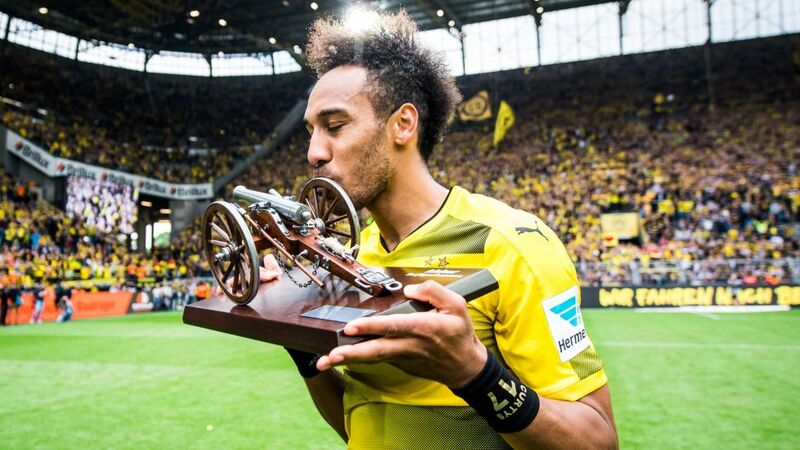 A whopping 877 goals were scored in the Bundesliga this season - Pierre-Emerick Aubameyang accounted for 31 of them to win the Torjägerkanone - Germany’s top goalscorer award. One promoted club, RB Leipzig, climbed all the way into second place and qualified for next year’s UEFA Champions League. Bayern Munich took the title for the fifth year in a row. Freiburg’s Nils Petersen’s nineteen goals as a substitute this season took him past Alexander Zickler’s tally (18) to make him the league’s all-time leading substitute goalscorer. Champions Bayern conceded just 22 goals all season. The second-stingiest defence in the league (Hoffenheim) let in 15 more. Only three players prior to Aubameyang had managed to score more than 30 goals in a season: Gerd Müller (3 times), Dieter Müller, and Lothar Emmerich (once each) – with Dieter Müller the last to hit that mark in 1977. Aubameyang set a new all-time single-season goalscoring mark among foreign players. His rival Robert Lewandowski held the previous record of 30 - the tally he reached in 2015/16 and 2016/17. Bundesliga referees awarded 98 penalties this season, the most in 15 years. The 2016-17 Bundesliga outstripped its combined goals total from the previous season (866) as well as that of two years ago (843). The average number of goals per game was 2.9. Substitute players had a banner year in 2016/17, scoring 124 goals to smash the Bundesliga record of 110 set in 2004/05. Last season, players coming off the bench scored just 85 times. Games involving Werder Bremen saw the most goals: 125 on the season. That’s 3.7 per game! The number of yellow cards in 2016/17 was slightly down from last season, but was still greater than each of the six seasons before that. Goals were up this season, but shots on goal were down. The league total was just 7633, or about 25 per game - the lowest since the Bundesliga began recording shots. The Bundesliga’s average attendance mark topped 40,000 for the ninth year in a row this season to remain the best attended football league in the world.